MAARS is looking for a Social Media Manager. If you meet the requirements below, you will be eligible to apply via Digital Marketing Community. Develop and implement digital/social media strategy across a variety of clients (brands) with a focus on content creation, social media and digital. Perform a quality content that returns high engagement and interaction. Manage and optimize social campaigns and report analytics to the director daily. Proven digital marketing knowledge and expertise, preferably from a media background. Deep experience with implementing social campaigns. Extensive experience in using data and analytics tools such as (Google Analytics and Facebook Insights). Proficient knowledge of social media platforms and how each platform can be best leveraged. Advanced understanding of using Google (webmaster and Keyword Planner). MAARS is a market leader in media and advertising jobs for media and advertising professionals. MAARS’ extensive contacts and committed focus on the Australian media and advertising industry is enviable, with a high level of repeat business being a testament to the success of their approach. 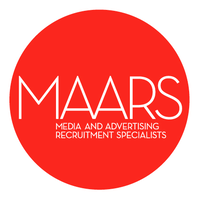 MAARS is a market leader in media and advertising jobs for media and advertising professionals. MAARS’ extensive contacts and committed focus on the Australian media and advertising industry is enviable, with a high level of repeat business being a testament to the success of their approach.